Ultimate Ears and JBL fight against each other in the lucrative Bluetooth speaker market. 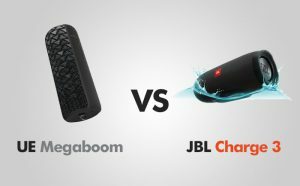 UE Megaboom and JBL Charge 3 compete in the same segment – portable speakers. They are similar in size and weight. On paper, they also have similar battery life, frequency response and the same certificate of water resistance. Let’s check if this also true in real life and see which speaker is better for you. UE Megaboom is very similar in design to Boom 2, just larger. It has the same cylindrical shape. It’s 226 mm (almost 9 inches) tall and weighs 876 grams (1.93 pounds). Although, it’s bigger than Boom 2, it’s still portable. The speaker is a combination of rubber and protective fabric which is stain and water resistant. It is available in the following color patterns: Black, Charcoal Black, Charcoal Black/Yellow, Electric Blue, Galaxy, Lava Red, and Plum. minus “-” button on the side. On the bottom, you will find a 3.5 auxiliary input and micro-USB socket for charging. They are covered with a thick rubber seal to keep the water out. The speaker is IPX7 waterproof. This means that you can submerge it in water up to a meter deep for the maximum of 30 minutes. UE Megaboom comes with a free app which you can download for IOS and Android. Here, you can tune the speaker’s equalizer and set alarm. The speaker is a mix of hard rubber and durable protective fabric. When you take the speaker in your hand, you can see that you deal with a premium device. It feels sturdy and very well made, and thanks to its rugged design and small size (it’s smaller than Megaboom), the speaker is very portable. While UE Megaboom is supposed to be used in a vertical orientation, the JBL Charge 3 should be oriented horizontally, on its rubberized stand. The stand is punctuated by a row of small LED lights, indicating the battery status. JBL Charge 3 offers the same, IPX7 water resistance as UE Megaboom. All important ports are hidden behind a rubber panel to ensure that no water will get inside. Here, you will find a 3.5 mm socket for a more stable wired connection, and both micro-USB and Type C ports. Similarly to its competitor, it also available in various color schemes: Black, Blue, Camouflage, Gray, Red, Teal. Although both speakers are portable, thanks to its 360 degrees sound, the UE Megaboom is especially great for an outdoor use. While other speakers tend to be more directional, Megaboom play music in all directions. The sound truly surrounds you and it feels like the speaker is much larger than it really is. Megaboom, thanks to its larger form factor, can play louder than Boom 2, with clarity and no noticeable distortions. While bass was the weak point of Boom, in Megaboom, thanks to larger woofers, this is not the case. JBL Xtreme offers better bass, but it’s not that great to throw it into your backpack and go for a trip. The high end seems to be a bit enhanced, but not to the level of being too harsh. This speaker is not going to compete with bookshelf speaker (and it’s not supposed to), but it can easily fill a room with sound. Thanks to its passive radiators on both ends, it produces better bass than other speakers its size. You literally can see music playing as these radiators move. It’s good as long as you don’t push the volume too high, then it becomes a bit harsh. It can be oriented vertically, but you really should place it horizontally on its rubber stand. If you place it standing up, you will be blocking one of its passive radiators and the sound will be distorted. It doesn’t offer a 360 degree sound, so be sure that you place it so that the logo points in your direction. Bass is solid, but not overdone like many others. It works best on a hard flat surface because it resonates the sound. While mids are not bad, they are the least favorite part of this speaker. The vocals are sometimes thin and busy tracks can get a bit muddled. To my ear, Charge 3 is a bit light on the high end. I think the waterproof mesh is responsible for this. When you have a waterproof speaker, there have to be some compromises. In order to pair this speaker with your phone, you have two options. The first option is a standard way of pairing devices that don’t offer the NFC (Near Field Communication) feature. Just press the Bluetooth button to enter a pairing mode. Then choose a pair from Bluetooth menu on your phone or tablet. The second method is faster. If your phone is an NFC enabled device, just tap below the + and – buttons to pair devices, without the need for a menu. You can also connect devices in wire mode, via a 3.5 mm jack on the bottom. The device comes with a free app for Android and IOS, where you can open speaker’s extra features, such as alarm clock and “Party Up”. The latter feature allows you to connect up to 150+ Megaboom (or Boom) speakers and play them in party mode. The range is what you can expect from a Bluetooth speaker – about 30 meters (100 feet). The JBL Charge doesn’t offer the NFC feature. To pair a phone with the speaker, you have to press the Bluetooth button and find the device listed on your device. It will connect automatically each time the devices are turned on. The range is similar to that offered by Megaboom. I could get more than 10 meters through multiple walls. If there are no obstacles you can get at least 20 meters (60 feet). JBL has a similar function to UE “Party Up” – it’s called “JBL Connect”. With this feature you can connect multiple JBL speakers in sync, offering better stereo separation. There is an app you can use to connect speakers and change the default function of the play/pause button. The Megaboom offers 20 hours of battery life. The battery can be charged from a completely drained to full in about 2.5 hours. The thing I don’t like is that when you charge Megaboom, you have to place it on its side or upside down, which is not desired position, especially if you want to play music while charging the device. You can charge this speaker via Micro-USB and although you can use any charger, I suggest to use an included AC adapter. In order to check your battery level, press and hold, + and – buttons. The voice will inform you how much battery you still have. JBL Charge has a 6,000 mAh battery that offers 20 hours of battery life, which is the same as Megaboom. But it also has a nice feature that few other speakers have. It can be used as a power bank. Just connect your phone via USB port to charge it and play music at the same time. On the bottom of the speaker, there is a row of small indicator LEDs. They show how much battery power remains. I find this solution more useful than that of UE. You don’t have to press any button to find out if it’s time to charge. PROS: Waterproof / Good looks / Good battery life / Can sync multiple speakers / 360-degree sound. PROS: Waterproof / Good battery life / Can sync multiple speakers / Good looks / Can be sued as power bank / Battery level indicator. CONS: It’s tricky to charge and listen at the same time. CONS: Could be better at mids and treble. Although UE Megaboom used to cost $300, now, it’s much more affordable and you can get a great deal on Amazon. It offers a great 360 degrees sound and it’s great to take on a trip. JBL Charge 3, on the other hand, is very affordable. It’s waterproof and can be used as a power bank. It’s especially great because for the price of Megaboom you can have two Charge 3 speakers and pair them to play in sync, offering a better stereo separation.